What can there possibly be left to say about the Citroën 2CV? Should we simply rehash its backstory, acknowledge its long commercial career, mention the cars it sired, and allude to its afterlife once production ceased? Surely this alone will not do. The problem with approaching cars which have attained the status of holy relics, is finding a means to see them clearly, unencumbered by the layers of nuance, of context, of perception, of received wisdom and preconceived notion which have accumulated over the half century the car was in series production, not to mention the subsequent decades since its retirement. For there have been many 2CVs, not simply by consequence of its sheer fecundity (over 5 million made), nor the multitude of direct and indirect derivations, but in terms of what the car itself came to represent and indeed those to whom it primarily appealed. Created for an entirely different world to the one it entered, intended for a primarily rural customer, the 2CV would fall victim, first to geopolitics, then to a fundamental shift in demographics and socio-cultural change, and ultimately of course, to time itself. France to this day remains a country with a large and intensive agricultural sector, but in the mid-Thirties, a huge swathe of the population was resident in the countryside and were desperately in need of something in advance of a horse and trap. The 2CV programme was commissioned in 1936 by Citroën’s Director-General, Pierre Boulanger, who recognised the opportunity to produce a vehicle substantially simpler and more affordable than the middle-class Traction Avant that Citroën were just starting to produce in volume. Not only more affordable however, but something more fundamental in purpose and design. Boulanger, a seemingly modest and frugal-minded individual who had no time for dogma or imitation marshalled a team of free-thinking engineers, lead by André Lefebvre, handing them what could only be considered a dream brief. ‘An umbrella on wheels‘, he decreed; this being the what, leaving it entirely up to them to establish the how. The Tout Petit Vehicule (TPV) was precisely what one might imagine a former Voisin-trained engineering director might have co-created, for it relied more upon aviation practice than the kind of blacksmithery habitually then associated with the motor car. The TPV, which closely resembled the production 2CV in appearance; albeit, in an even more rationally austere fashion, was built on a chassis and bodyshell made of Duralumin, as were most of the vestigial external panels. Only the wings and ribbed bonnet were steel pressings. The roof was naturally clad in roll-back canvas and of headlamps, there was but one – for one was all that was necessary. The technical felicities and notable differences to the production car were such as to necessitate an article in its own right, but suffice to say, the essentials (and only they) were there. It is believed for instance, that the clever centrally mounted coil-springs which coupled both front and rear suspension arms on either side, not to mention the inertial dampers which lent the production car such an absorbent, loping ride quality were part of the design intent, but were not readied in time for the TPV prototype – at least those of the surviving versions built, to say nothing of the many more subsequently destroyed shortly after the outbreak of hostilities in 1939. Throughout the war, the few remaining TPV’s were hidden away; Boulanger, who refused to collaborate with the occupying forces insisted on keeping his brainchild from falling into hostile hands. Quietly, throughout the war years, the TPV concept was developed and improved. The production 2CV, when finally introduced at the first post-war Paris motor show, was almost decadent by comparison to that of its pared predecessor, but by any other measure – even the standards of ration-wrought 1948 – was an object lesson in essentialism. A second headlamp was fitted (oh the profligacy!) but the bootlid would remain composed of the same hard-wearing roll-back canvas material as that of the roof. Another key difference lay in motive power – the TPVs employing water-cooled horizontally opposed twin cylinder engines, whereas the 1948 car’s unstressed alloy 375 cc powerplant was air/oil cooled – both of which were designed under Italian engineer, Walter Becchia. Also, the 2CV’s now pressed steel body, (aluminium being in very short supply) while cleaving closely to the TPV design, was refashioned, if such a lavish term is appropriate, by resident Quai de Javel stylist, Flaminio Bertoni. The production 2CV stands comparison with another notable light car debut of 1948, that of Morris Motors’ Minor. A rather different and on the face of things perhaps, more sophisticated looking answer to a broadly similar question, the Minor was conceived to a less exacting brief and while intended as a more technically advanced machine than the car which eventually entered production, was developed under conditions of less intellectual and creative freedom. At the bureau d’etudes, despite Director-General Boulanger’s aloof manner, Citroën’s engineers enjoyed his broad rapport, whereas Morris’ lead concept engineer, Alec Issigonis was up against a more conservative engineering mindset and a seemingly intractable opponent in Lord Nuffield, who famously derided the ‘Mosquito’ prototype as a ‘bloody poached egg’. Heaven knows what he’d have made of Levallois-Perret’s Tin Snail. It’s been stated that the Martini-quaffing Spartan from Smyrna was a noted enthusiast of the Citroën, being particularly taken by the early 2CV’s corrugated panels, but for all of that, Issigonis never attained quite the same level of studied minimalism, or technical sophistication – although it could be suggested that with the original Mini, he got closer than many. A common misconception regarding the 2CV is that it was a small car. It was in fact a light car, and by modern standards, a narrow one, which made it a far handier machine in confined spaces than many seemingly more compact vehicles. It was this, amongst its other virtues which made the deux chevaux an adept city dweller, unlike many from the countryside who make an uncomfortable shift towards urbanity. But it was the 2CV’s lightness which was perhaps its primary virtue. That it proved itself so adaptable, so easy to live with and so durable, not only in the manner in which it ran and continued running, but also in terms of its commercial appeal, lies testament to the serious thought to which its creators lent to the task set to them and the careful application of intellect and craft with which they executed it – although whether Citroën always built them to the same exacting standards is open to question. But in service, the simplicity, access and ease of effecting most maintenance functions was really quite astonishing. The 2CV’s career began as intended – a huge commercial success, with demand amid the French countryside such that a waiting list soon formed. By the late ’60s, as France became more sophisticated, the deux chevaux instead became the preserve of the impecunious student, the social reformer, the ecologist. But France gradually turned away from its rural past, the 2CV perhaps becoming an uncomfortable reminder of more impoverished times. By 1990 time had run out for the Tin Snail. Today, it has in some quarters at least, become shorthand for a fetishized form of car enthusiasm. It’s little surprise that several high profile auto-journalists and presenters make considerable play of the fact they possess and enjoy early examples of the breed. After all, what better manner to display their fealty to the automobile at its most essential? Cynical? Perhaps, but it is nonetheless comparatively easy to understand why anyone who genuinely cares for the motor car might covet one. Because the Citroën 2CV, despite its rudimentary appearance is a beautiful car. Its beauty lies not only in the inherent satisfaction derived from its rational simplicity, it also resides in the intelligence of its conception and the intellectual rigour of its design. It lies within the human-focus and lack of conceit in its intent and execution. One could define it in socialist terms – it was a car for the people, yes, but as such it neither patronised nor pandered. Indeed, despite its apparent asceticism, it offered far more than the customer required, yet did so unsparingly – Boulanger’s rationale being that the French peasantry should be offered the best that could be possibly conceived, notwithstanding the necessity for it being simple to use, straightforward to own and inexpensive to maintain. It couldn’t be done today, for a whole host of reasons, but primarily because the modern motor industry would never countenance offering so much for so little. So having rehashed its backstory, acknowledged its long commercial career, mentioned the cars it sired, and alluded to its afterlife once production ceased, what is left to say about the Citroën 2CV? Perhaps this: A car created without an ounce of cynicism – after all, doing so would only have added needless weight. There’s a nice BBC doc called Tin Snail on youtube from around 1986 which is worth a look. Despite Citroen making a number of mistakes prior to its bankruptcy and acquisition by Peugeot, with the benefit of hindsight they could have arguably updated the Citroen 2CV to a more practical retro icon similar to the 2CV Super prototype in featuring the Flat-Four engines from the GS (and Axel) yet featuring the 2CV hatchback conversions. The 2CV Super (with the GS engine, could they have realistically called it that?) puts me in mind of the Wolseley Hornet/Riley Elf derivations of the Mini. Completely misses the point. If anything, Citroen’s version is even worse than what the Mini had to suffer. Mercifully it never came to pass – frankly, the Charlston was insult enough. Would agree with you on the styling and name, though the concept of an updated GS-powered 2CV hatchback has appeal. Particularly if the lower end versions still has a nod to the original by carrying over a Flat-Twin variant either the 2CV-based 750cc+ version once mooted during Project F or the 750-850cc Panhard units (that Citroen criminally did not really do anything with beyond temporarily investigating an entry-level Flat-Twin DS). Would also agree on the Wolseley/Riley versions of the Mini, at least in terms of the questionable decision of continuing to use diluted low-volume marques and not using the Minivan wheelbase to allow for more useful 4-door variations. Forget the ugly new look of these contraptions. 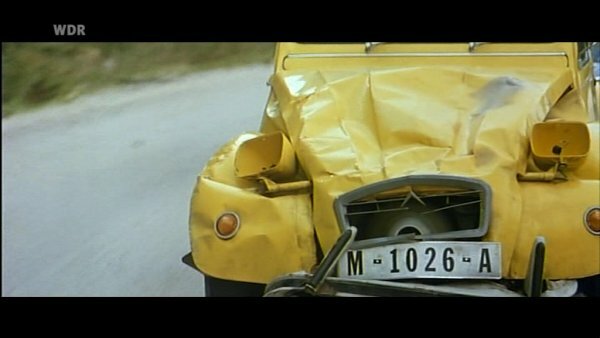 The real 2CV Super came in ‘For your eyes only’. You can clearly see the white cooling fan running at fresh air of the flat four – 2CV twins had black fans running in a cage. It took them considerable effort to create an exhaust system for the GS engine that made the four sound like the twin. Many an Ami Super ended as platform donor for 2CV conversions. The BMW R series flat twin motorcycle engine does seem to work in the 2CV, otherwise given the choice would lean towards a GS or Panhard engine (the latter putting out 42-50 hp in the Panhard 24). It brings to mind the BMW Z13 concept that also featured a motorcycle engine, albeit an inline-4 from the BMW K1100 instead of an originally intended water-cooled four-cylinder horizontally opposed engine (possibly based on the R series flat twins?). Along with the 1990 BMW Kyo that also used a BMW motorcycle engine. While they’re not small cars like the 500 or Mini, they are definitely a lot smaller than most of today’s small cars, especially in the width. Still, plenty of room inside and the only car that I can still get in and drive after the shorter “other half” has driven it. Useful for going down to the tip or hardware store as well, as you just remove the seats, and/or roll back the roof. Yes indeed, a lovely piece. It is fascinating that a car designed for rural France became so suitable for urban use (in a way that today’s insufferable SUVs are not). You used to see lots of them in Edinburgh. I guess nothing else rode the cobbles so well. They also give off a Bohemian vibe, of course, which a lot of Edinburgh folk like. I now live in London, and a neighbour still has one, which is driven once or twice a week. She won’t have it for much longer, of course, because the incoming Ultra Low Emission Zone will make it unaffordable. Urban air quality is a huge issue but the ULEZ is a fine example of heavy-handed legislation, designed to make law makers feel accomplished but not actually tackling the core issue. Should my neighbour replace her 2CV with a brand new SUV? Would that really help address our looming environmental problems? Of course not. Would be an easy job for conversion to electric to solve the emission problem assuming she has a parking slot allowing a charge port. Dave.. The 16 kw battery pack as in the Mitsubishi iMiev weighs 150 kg which is hardly the weight of the 2CV at 585 kg. You would need to deduct exhaust system and fuel tank weight (unknown) plus the fuel it holds, 20 ltr at 15.4 kg. The combustion engine would probably equal the electric motor weight however there would be some cables etc to account for so yes the overall weight would probably be like carrying an extra passenger, hardly a negative if she wanted to use her beloved 2cv within the congestion zone. A fine article, many thanks. I love these cars. We had one for a number of years, my wife announcing her purchase of it one day on my return from work – we had shared a car up until that point. It was a 1987 registered red Special, and everything that Eóin describes. It has a special place in our memories as I drove my wife and son home in it from hospital after his birth on a bitterly cold and snowy late October morning. We passed it on to a complete enthusiast for nothing so that he could spend the sale/ purchase money instead putting it on a new chassis frame and bring it fully back to health. the beloved 2CV. As a child, we mocked them and pointed and laughed. The school art teacher had one in the plum and custard colour scheme. The PE teacher fancied her but wouldn’t go near the Citroen. As an adult, I grew to love them and even joined the 2cv club to gain a better understanding of them. It worked! An utterly adorable and simple, humble and honest machine. I never got to actually driving one but have had several, huge grin inducing trips in them. Top down and in any weather, even in snow – wonderful, hilarious and memorable. That Tin Snail documentary is marvellous – all the more so for how dated it now appears. Dated insofar as it lacks the ironic commentary, the needless and pointless visual gags and the painful attempts at humour which a modern attempt at such would feel required to add. Poignant too to see (and listen to) the engineers who developed the car. Most likely all deceased now. The more I think about it, the more I have come to believe that the 2CV is perhaps the only car that truly matters – largely because the passage of time has if anything only lent it an even deeper relevance. André Lefèbvre died in 1964. Flaminio Bertoni deceased in 1964 a couple of days after creating the new nose for the DS. Paul Magès lived until 1999, Walter Becchia until 1976 and Pierre Boulanger died in 1950 in an accident at the wheel of a Traction Avant. Jean-Pierre Ploué told that Peugeot collected the 2CV’s original engineering drawings and destroyed them just to make sure nobody could reference this car. Another aspect of these cars is anyone with a modicum of mechanical sense can work on them plus even major components such as the engine can be lifted free of the chassis by a moderately strong individual. I’ve lifted an engine out using the exhaust manifolds as handles, lifted a body sans doors and walked if off the back of the chassis. One needs to be careful here for when I stepped off the chassis I hadn’t allowed for the loaded suspension that was supporting my weight plus the body, as a result I was almost launched into orbit, Lesson learned! What other car allows an owner to push it with one finger or to disassemble and fettle its ignition switch? What other car has no rubber hoses in its hydraulic brake system? What other car uses a split gear that has its two halves spring loaded in opposite directions to compensate for wear while driving a short cam shaft, which in turn drives the points? Except for point and valve gaps no adjustments ever needed and no noisy sloppy cam chain or time limited belt to fail. One of my all time favourites, love the 2cv and Dyane. As one who has owned many of these delightful vehicles I must concur with all previous comments. Compared with myriad Italian cars that have been in my possession over the years those I owned were a breeze to work on, and I doubt there are few other vehicles that one can do a chassis swap on single handedly in a single day as I did some decades ago. One aspect to be aware of as I found to my peril is never reverse as fast as one can over a distance greater than one would park at. The collar which retains the reverse gear will unwind itself allowing the gear to slip on the shaft thus locking up the entire gearbox. However the design of the 2CV allows the top of the gearbox to be removed in situ, and, with some judicious manoeuvring of said gear and collar they can be coaxed back into their appropriate positions on the shaft – something few other vehicles can boast of I am sure. Many thanks for a well considered piece of writing. I recall back at the turn of the present century modding a 2CV chassis to 3 wheels and to run on LPG. Everyone else was converting to Lomax trikes but my design would have been an enclosed tandem two seat body no wider than the chassis. The body would have sloped gently up from the engine,arched over driver and rear passenger then curved sharply back down to the chassis leaving the single rear wheel exposed except for a cycle wing/fender. Spare wheel would have been mounted up front as an engine cover. Front wheels would have had cycle wings that turned/steered with the wheels. There would be a rack at the back for strapping “whatever” or optional side mounted saddlebags. Oh yes there would have been a roll back roof. Alas with “would have” repeated five times above its now obvious the started project was never completed due to a major move of premises so the modified running chassis was sold on. This has brought back so many memories I just might consider reviving it.